First the admin stuff: I’ve decided to show only 3 posts per page. I’m not sure if this matters or not to anyone other than me, but it makes the traffic on my server easier to handle. The traffic… I thought when we left Southern California we also left traffic behind! Not so. When I made this blog public I was expecting maybe a couple dozen foodies to drop in from time to time to talk food. But now, each time someone links to me on StumbleUpon, it’s as if all of those people are kicking my dear old server in the shins. This blog, my other blogs, and my entire website go dead. So until I can switch out the hardware and optimize caching within the next week or so, I am blocking requests from StumbleUpon. Sorry folks – but you are killing me with your love and I think we need a break… just a short one. It’s not that I don’t enjoy visitors, just that I hadn’t prepared appropriately for the magnitude. So let me be a proper host and get my house in order (i.e. put the old server out to pasture). On to the topic of the day: larb or larp or laab. It is a wonderful Thai seasoned meat salad of sorts. We were introduced to the dish by our friend, Pailin. She’s Thai and she’s a chef and she’s amazing. We met her hitch-hiking in the Eastern Sierra. Jeremy and I had hiked out of the John Muir Trail a day early because we fell a day behind and were going to miss our scheduled shuttle pick up at Whitney Portal. Instead, we exited via Kearsarge Pass to Onion Valley where we encountered Pailin and Wayne as they finished a day hike. I had never hitched before, but I’m not a very intimidating person (except that I stunk something awful after 6 days of backpacking without a shower), nor did they appear to be serial killers. Gee, I hope my mom isn’t reading this… I asked if we could catch a ride into town. We became fast friends and they stayed with us in Pasadena a couple of times when they came to LA to replenish their pantry with Asian groceries. Wayne and Pailin treated us to dinner at this authentic Thai hole-in-the-wall joint in downtown LA. That’s where we had laab and that’s where the addiction began. My version of the dish uses ground turkey because it’s healthier, and I probably Chinesified it over the years adding ginger and garlic. When I decided to post this recipe, I realized that perhaps I should check its authenticity against some of my Thai recipe books. Hmmm, no garlic or ginger… Anyway, you can use pork or beef or chicken or tofu. There appears to be enormous flexibility on this dish. How to describe this if you’ve never had it? Salty, tangy, minty, spicy, refreshing, and satisfying. I trust if I’m screwing this up that HolyBasil will offer up some advice. It seems that there are many ways to prepare the dish, so I’m just going to dive in head first. 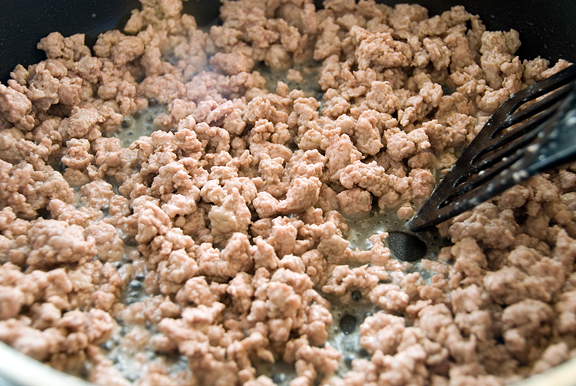 I sautéed the ground turkey in a little vegetable oil until it was thoroughly cooked. Next I added the lemongrass and shallots and stir fried until the shallots were soft. 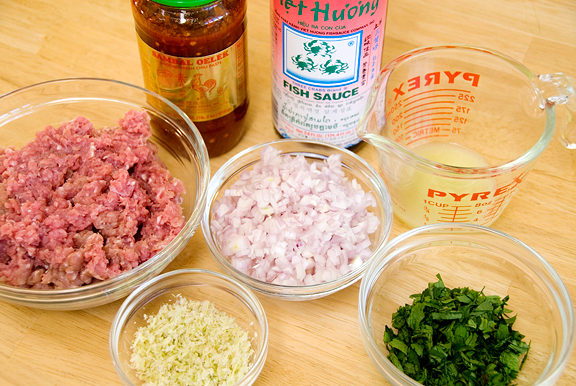 Some recipes say to cook the meat in the fish sauce and lime juice, others say to add it off the heat. I always add my lime juice after cooking because I don’t want to lose any of those amazing vitamins. Toss in the rest of the ingredients and mix well. 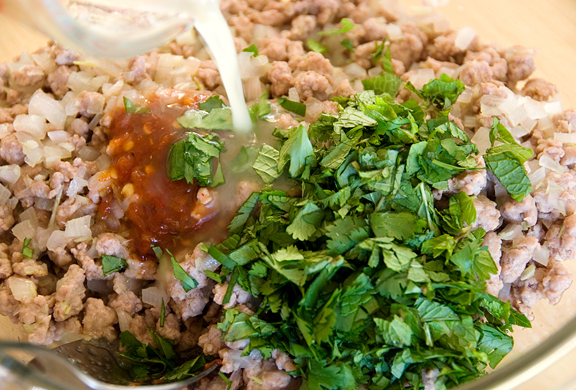 I serve the laab with ground peanuts and extra mint/cilantro on top alongside steamed rice and fresh cabbage and basil leaves for wrapping. It is so aromatic and lovely to eat any time of year. Heat the oil in a frying pan. 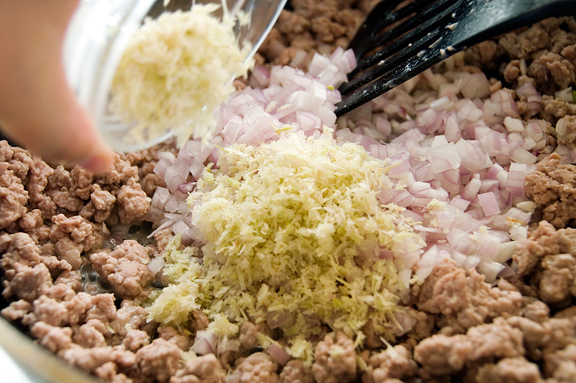 Cook the ground turkey until browned. Add lemon grass and shallots and sauté until shallots just soften. Remove from heat and transfer to bowl. Add the remaining ingredients except for the peanuts. Stir together well and garnish with peanuts and extra mint and cilantro. Serve with rice or sticky rice, fresh basil leaves and fresh cabbage leaves. Oh, this looks good! We met laab/larb last year as we backpacked through Thailand/Laos/Cambodia/Vietnam, mostly in Thailand and Laos. We had it with almost every kind of meat. Most funny was when we tried to order a duck version in Laos and pronounced the word for it (phat – there are seven ways to pronounce this and each mean something else!) and ended up with extra handful of chilies (another meaning of the word!) instead. But we were brave… Later I made this a couple of times at home but not enough to have it in memory and my trusted thai cookbook (among with all my other cookbooks!) is still in storage (2 months to go!). I think there was no ginger and garlic but thai basil and ground roasted rice, but I am not sure. Anyways, yours looks yummy the way it is! This dish looks so yummy. I think everything tastes better with crushed peanuts. I like that you used turkey instead – healthy but still delicious. I’m no thai/lao food expert, but I know when I cook lemongrass (unless it’s for marinade), I usually add it to the oil first as it becomes very fragrant that way. I imagine the difference isn’t remarkable, though. When I think back on the summer I hitch-hiked through the Dordogne region with a friend, I start to doubt my common sense, but again..we had a blast! I love laarb and make it served in lettuce leaves with some mint (makes me think of Vietnamese nems). Hande – yes, I learned from my Thai friends that it is a tonal language. I mean, Mandarin is also a tonal language (four tones per sound), but Thai is something like sixteen! Lovely that you traveled through SE Asia. Something I think I’d love to do some day. HolyBasil – hey, thanks for the lemongrass tip. I’d not have thought of it myself. And thanks for the approval on the fish sauce (I noticed that brand can really make a huge difference in the flavor of a dish)! I think I’d be more afraid to hitch in populated areas than in wilderness areas, but I’m a chicken in general. We were perfectly willing to hike out the additional 13 miles to town if need be ;) Glad you’re still here. This looks really good. I really like the idea of topping it with peanuts! Kevin – the peanuts totally make it! I have had a dish very similar to this at my favorite Thai restaurant. They call it Nam Sod. Is it the same? I love it. I have some leftover steamed spareribs in garlic black bean sauce in the fridge. This would be a great supplement! Susan – It might be the same. I know very little Thai (okay, I know none). Nam is pork – I think. 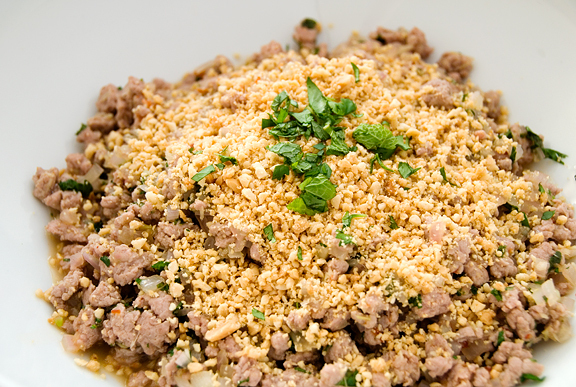 This dish is often made with ground pork so it could very well be Nam Sod. I had this at Chi Thai in Boulder and they made it really spicy for us. It had something crunchy sprinkled on top which the Thai owner explained was toasted rice that had been coarsely ground! I tried my hand at it but it wasn’t half as good as his. Need to go back there again! I made mine with ground turkey, too! I’m Laos Thai and Vietnamese and I just wanted to know I loooooove our blog!